Alder has a nice, light smoke flavor, good all purpose smoke. For use on all meats and fish, from smoked salmon to jerky. A sweet, mild flavor, good for wild game, poultry, and shellfish. Cherry wood, like apple, is fantastic with nearly any cut of meat and provides a nice sweet smoke flavor. Many competition BBQ chefs use cherry to achieve a dense smoke ring. 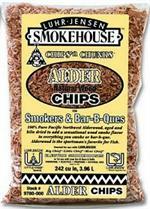 A traditional flavor for jerky, ribs, pork shoulders and most beef or pork barbeque cuts. A southern favorite for deep, sharp smoke flavor. Recommended for all barbeque cuts, sausages, and jerky.